The latest weekly report of the United States Mint’s numismatic product sales includes the debut figures for the 2014 Kennedy Half Dollar bags and rolls as well as the Great Smoky Mountains National Park Quarter Three Coin Set. 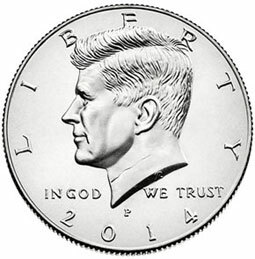 The US Mint began accepting orders for the circulating quality 2014 Kennedy Half Dollars in bags and rolls on February 13, 2014. The products consisted of a two roll set containing one 20-coin roll each from the Denver and Philadelphia Mints and a 200-coin bag containing 100-coins from each mint. This year marks the 50th anniversary of the coin series issued to honor President John F. Kennedy following his assassination. In addition to the typically offered bags and rolls, the US Mint also has plans for special anniversary products to be released later in the year. The current products have reached sales of 2,982 of the 200-coin bags and 9,584 of the two roll sets. This accounts for 979,760 half dollars and represents a stronger start compared to the prior year. The 2013 Kennedy Half Dollar products had debuted with total sales of 778,240 coins. Last week, the US Mint also opened sales for the Great Smoky Mountains Quarter Three Coin Set on February 11. Each set contains two uncirculated quarters struck at the Philadelphia and Denver Mints and a proof quarter struck at the San Francisco Mint. Through the reporting date of February 16, sales have reached 9,578 units. This is down moderately from the debut of 9,971 units for the previous release in the product line including the Mount Rushmore Quarters, but up from the next prior release featuring the Fort McHenry Quarters which had opened at 9,398 units. The recently released 2014 Warren G. Harding Presidential Dollar products enjoyed a relatively strong second week. The circulating quality coins are available in 25-coin rolls, 250-coin boxes, and 100-coin bags. During the current period, sales for the products included 844,050 coins. Cumulative sales for the coins have now reached 3,363,050. “2013 U.S. Mint Silver Proof Set	419,623	” is sold out. right? Yes, it is. I will add the asterisk.